As the Silver Canadian Maple Leaf coin entered its fifth year of availability, demand for the coins was on the decline. After flying out of the gates in 1988 and 1989, mintage figures were falling in advance of the 5th anniversary celebration of the coins. 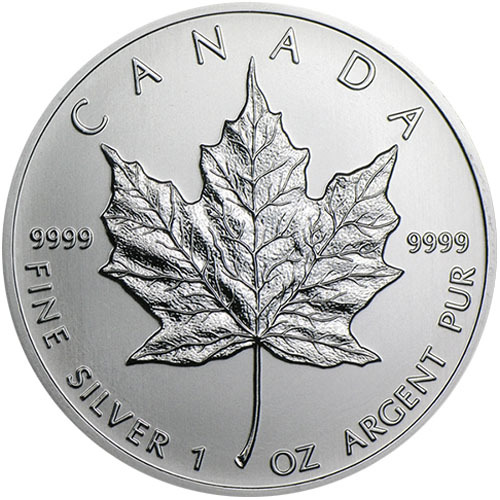 Right now, 1992 1 oz Silver Canadian Maple Leaf Coins are available to purchase online at Silver.com. Ships to you packaged in protective plastic flip! Fifth year of availability of the Silver Maple Leaf coin! Mintage total of 343,800 coins in 1992! Queen Elizabeth II’s portrait graces the obverse. A sugar maple leaf dominates the reverse. The Silver Canadian Maple Leaf arrived in the precious metals market in 1988 with a total mintage of 1.155 million coins. The very next year it had nearly tripled to a total of 3.332 million coins. However, throughout the 1990s the mintage of Silver Maple Leaf coins would slowly fall through the end of the 20th century, with one noticeable uptick in 1993. While the 1993 coins shot to 1.113 million in mintage, there was an immediate fall in 1994 to 889,000 and a more drastic decline to 326,000 in 1995. In fact, the mintage figures for the series from 1995 through 1997 marked the three lowest mintage figures recorded in the history of the Silver Canadian Maple Leaf collection. For its part, the 1992 1 oz Silver Canadian Maple Leaf comes in as the fourth-lowest mintage in the coin’s history. 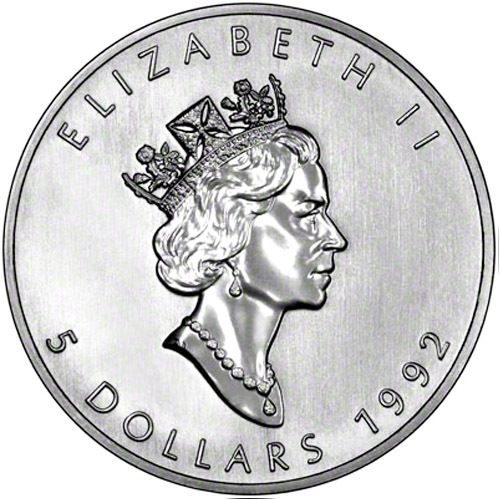 On the obverse of all Silver Canadian Maple Leaf coins is the effigy of Queen Elizabeth II. Her Majesty has featured on Canadian coinage since 1953 when she ascended to the throne of England. The Silver Maple Leafs debuted with the second-generation (1965-1990) design from Arnold Machin, but beginning in 1990 a new portrait came into use. These 1992 1 oz Silver Canadian Maple Leaf coins feature the third-generation portrait of Queen Elizabeth II. Considered the most regal and elegant design of Her Majesty, this creation from Dora de Pedery-Hunt was in use from 1990 to 2002 and is the first designed by a Canadian artist. The reverse of all Silver Canadian Maple Leaf coins still bears Walter Ott’s 1979 depiction of the sugar maple leaf. Created for the gold coins, all Canadian Maple Leaf coin variants feature this stunning design of the national symbol. If you have any questions, please contact Silver.com. You can reach our customer service team at 888-989-7223, chat with us live online, or simply send us an email. Don’t forget to check today’s silver price while you’re on our site!